This is one of our new collections that we have been super excited to feature on the blog and share what our design team created with it. We hope you find the new Day to Day Collection as amazing as we do. Now you may have remembered seeing peeks of the products in earlier posts like this one, or this one. Like always we'd love to have our fans sharing our fun ideas and we'd like to reward a few of you. Join us each day this week as we share inspiring ideas and we'll be watching for anyone PINNING to Pinterest, Sharing our Facebook Posts or leaving a COMMENT here on the blog. We'll announce the winners this next weekend. We couldn't have you leave today without sharing a darling layout by one of our design team members, Sherry. She did a great job highlighter one of her family members!! Our new day-to-day lives revolve around this little fella -- our dog, Montana. The new day to day collection is perfect in showcasing just about anything as it includes so very many icons. The two I wanted to highlight in this layout were the glasses and the camera. Both are too very cute and so endlessly classic, though trendy. 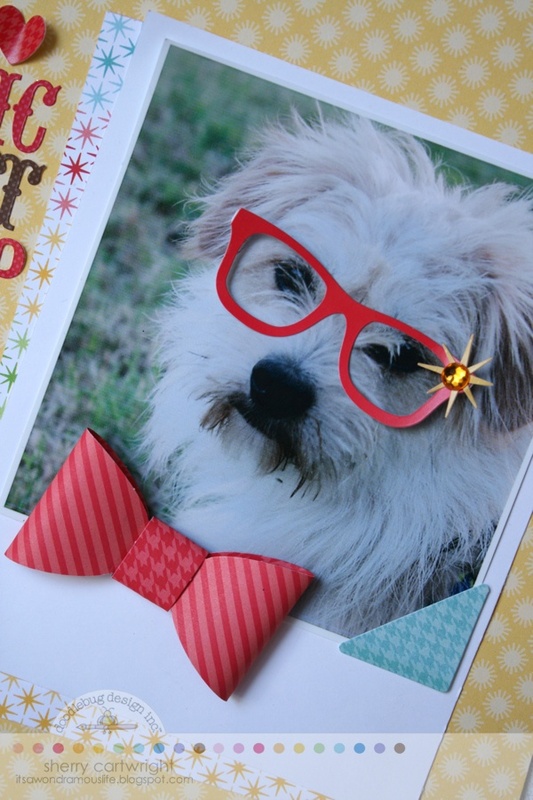 For this layout, I printed a square photo of the dog, then added it onto white cardstock to mimic a Polaroid photo. I tied it in with the camera Doodle-pop on some doodle twine. I hung the camera from the new pixie, along with a few of the pennants. The pixie is meant to be vertical, but I attached it to the layout horizontally to anchor the banner and camera. You'll also notice the new sprinkles on this layout. They mix very nicely with the jewels and brads. Though I've added alot of pattern on this layout, it isn't gaudy or overwhelming. Do you mix patterns, too? So excited for this collection!!!! Love the layout so cute!! Loving the colors of this fun collection! so happy to see this what fun! This is a fantastic collection!!! Love how fun your layout is. I love that puppy's scrapbook page, so cute! I think the way the banner is attached to a pixie is totally genius!! 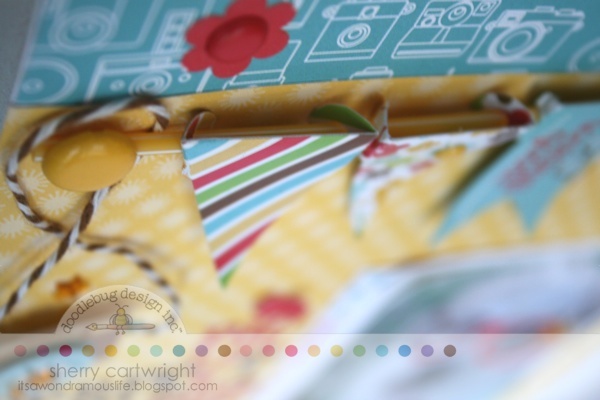 Love the colors and patterns on this layout!! All around it is very creative!! Ack! The glasses on the dog are just too cute, what a fun line this is! Such a fun line and just look at that dog! Too cute! LOVE these basic collections! They go with everything! How cute is that puppy with glasses??! Love this collection! I love this collection!! Can not wait to get my hands on it!!! Love this line! 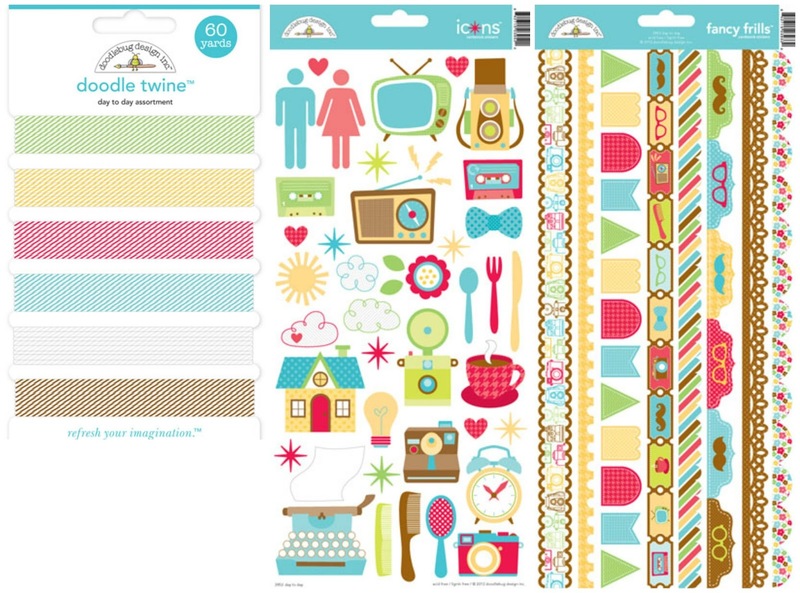 I always love Doodlebug! what a darling collection, layout and pup!! TFS! Oh My Goodness!! This pup is totally adorable and love the layout!! I hit the wrong thing - I am Melinda Wilson. This is my favorite Doodlebug collection! Love the cameras, and how CUTE is this layout with the camera, colorful banner and the pup with glasses+bowtie?! Adorable. Love this collection so much! The layout is the cutest thing ever! Even the picture on it is just adorable! I really, really adore this collection---it's so darn cute!! Oh my goondess - how cute!!! I think I need to get some glasses for my pooch! 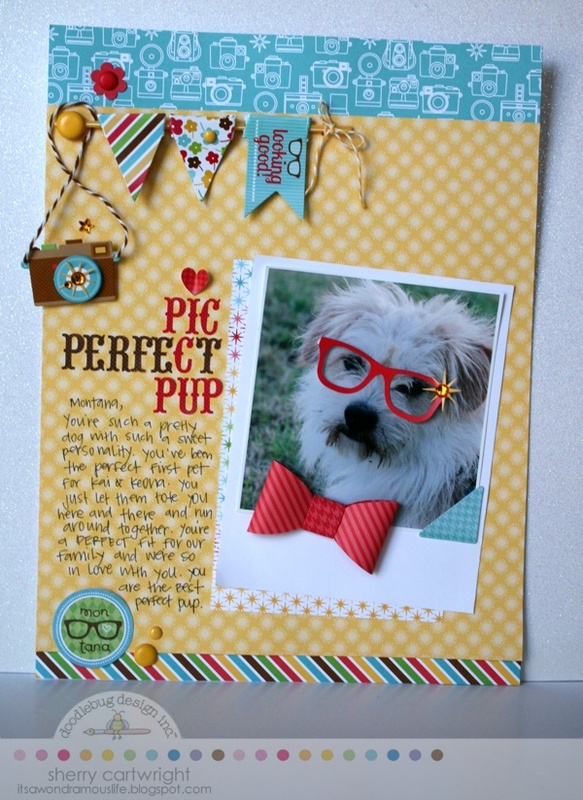 I love, love this layout, especially how you added the glasses and bow and twine to the camera. Very nice layouts with these new collections! FUN!!! Love Sherry's layout! This collection is perfect to have in my stash for so many different occasions. Love it! Cardstock Stickers - They look so nice. Looking forward to picking some up. That layout is adorable! Love the twinkle on the dogs glasses!! great layout and love the colors in this line super cute! Absolutely love this line....the glasses on the dog....adorable...I can't wait to play with this line. Well done! GREAT LAYOUT! Love this collection and all the wonderful colors and designs. And the twine is so yummy and rich in color. This is my absolute favourite collection ever!!! I adore the colors and images in this collection! So much fun to be had! Sherry's LO is awesome! I love the papers she used and the dog with the glasses is killing me! Thanks for sharing! Adorable line...love the bright colours. What a totally FUN collection!! That pup layout is adorable and her dog looks just like my Toby!! (minus the glasses...lol!). Awwww, this dog layout is so hilarious! I love the glasses so much. Cute collection and I love the dog with the glasses and bow tie. Love this collection! It's so adorable with the vibrant & happy colors! Love the light bulb pattern paper & the camera doodle pops.